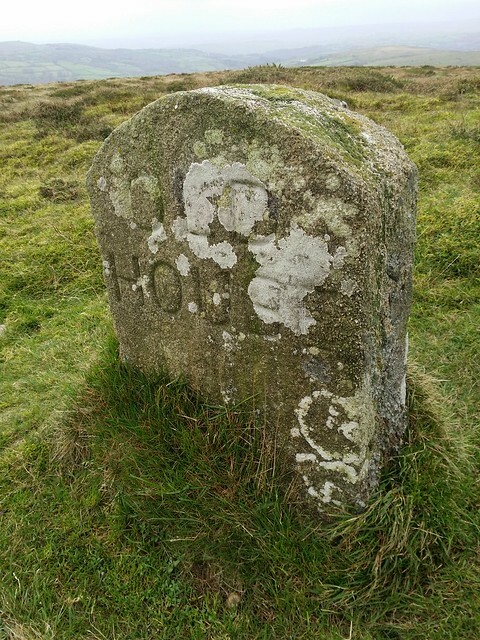 If you're looking for a fairly straightforward walk that will capture the beauty of the open moor in one go, you can't go far wrong with the Two Moors Way section along the Hameldown ridge. As well as having pubs located at both ends, it has sweeping views of the national park. I've walked the down many times and I will never tire of it. Today, was a bit different, with the small hindrance of "Storm Desmond" attempting to knock myself, Phil (@DaylighGambler) and Sarah (@PascallSarah) off the hill! 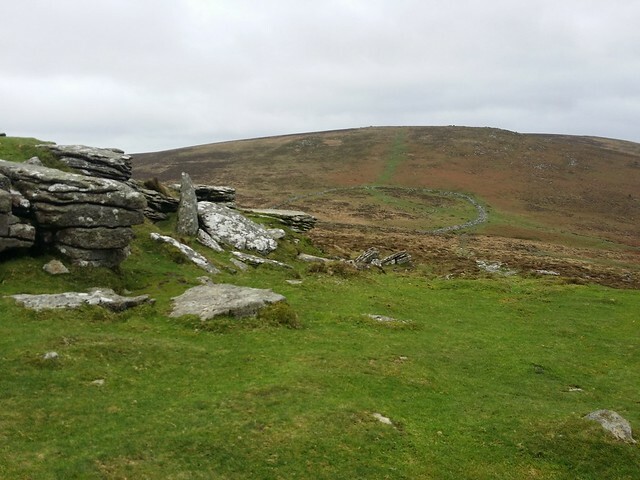 It all began by dropping Sarah's car off at the end, in Widecombe and then continuing to a small car park below Birch Tor, on the B3212, a short distance from the Warren House Inn. Suitably wrapped up against the elements, we climbed out of the hollow of the car park, and into the full force of the wind. Right from the start, it was obvious the gusts were going to add a couple of kilometres to our efforts. 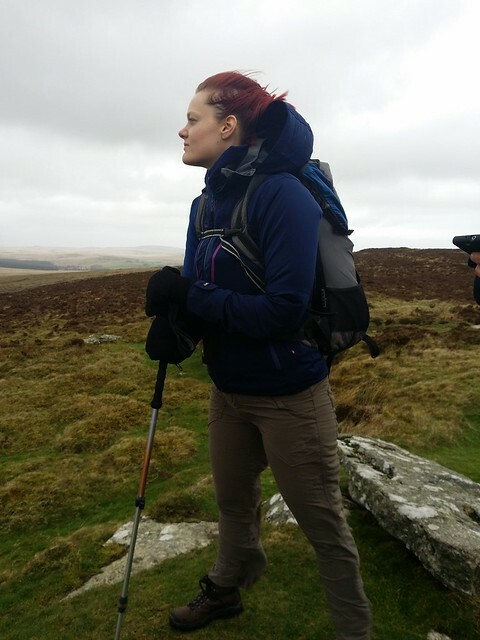 There was a brief delay en route to Birch Tor, while Sarah had to return to Phil's car to retrieve her car keys. Thankfully she realised within a couple of hundred metres of the start and not on the final descent into Widecombe! 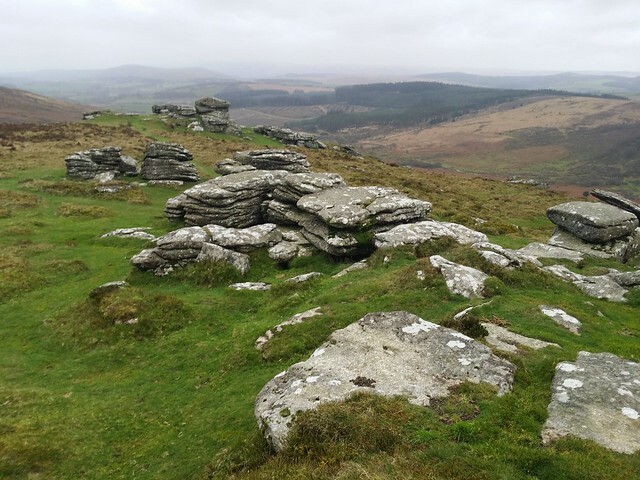 Birch Tor was as commanding as ever, towering above Headland Warren and the scarred valley of the Vitifer and Golden Dagger Tin Mines. 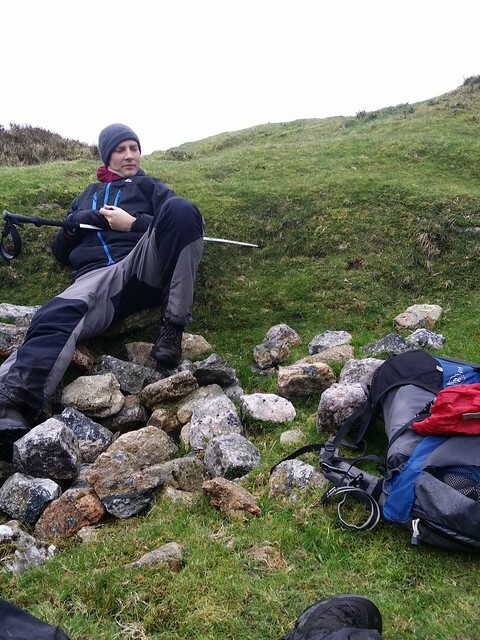 Buffeted constantly by the winds, we sought out shelter beside the tor, but little was to be had today. Not that it mattered too much, as it wasn't that cold and little rain was forecast for the South-West. Bizarrely, we were exhilarated by the novelty of the conditions. Sarah, faced the force head on, every time I looked around, she had a grin on her face, as if she was asking Desmond; "Is that all you've got?". I loitered to find somewhere to pee, whilst Phil and Sarah set off up the hill. I failed in finding a suitable place, encountering a hefty up draft just when I didn't need one! Whilst I was thankful, at least, for my waterproofs, let's just say I'm not sure why some people do that for fun, and leave it at that! 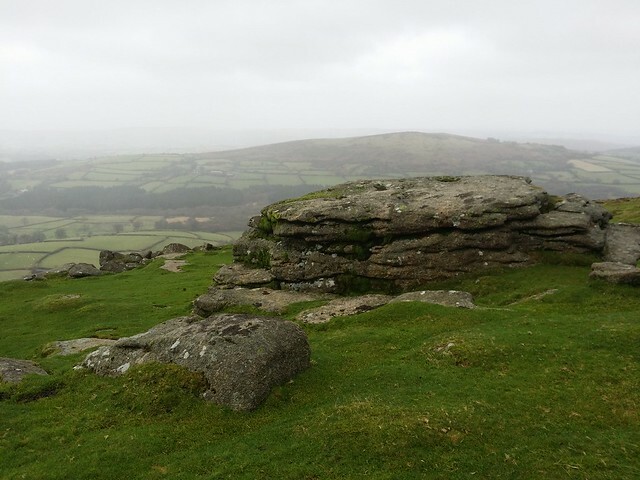 My "shower" complete, I caught up with the others, and with our back to the prevailing winds, it was light effort to Shapley Tor. It's main outcrop is short and uninspiring, but the odd outlying granite is of more interest, crafted by mother nature over the ages. We messed up a bit here; We intended to visit a tor on Coombe Down, but missed the turning into a field. Just as well really, because if we had got it right, we wouldn't have run into the Highland Cattle that have been attracting so much attention at the moment. 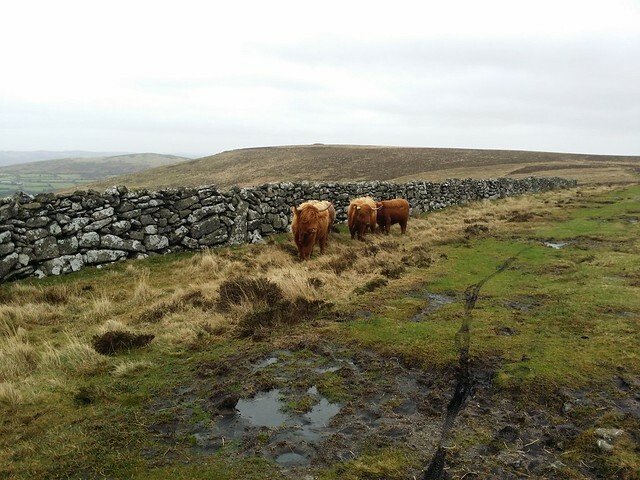 These mild mannered beasts are adorable and a welcome addition to the livestock grazing on the moor. With Coombe Down forfeited, we popped up to one of my all time favourite tors; Hookney. I have a particular soft spot for this outcrop. 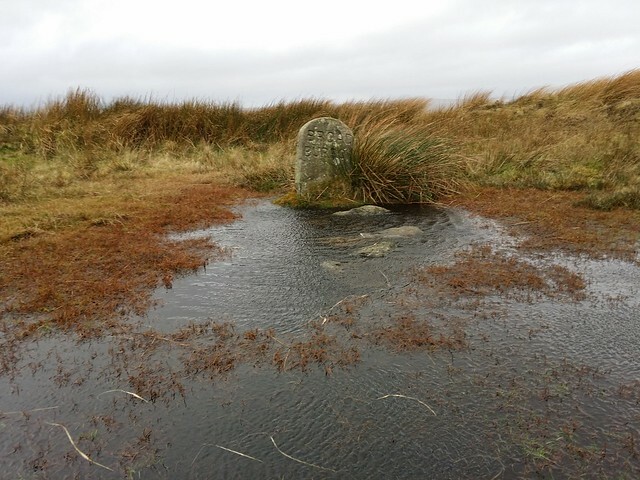 It is one of the first I ever visited, and likely where I first fell in love with the moor. 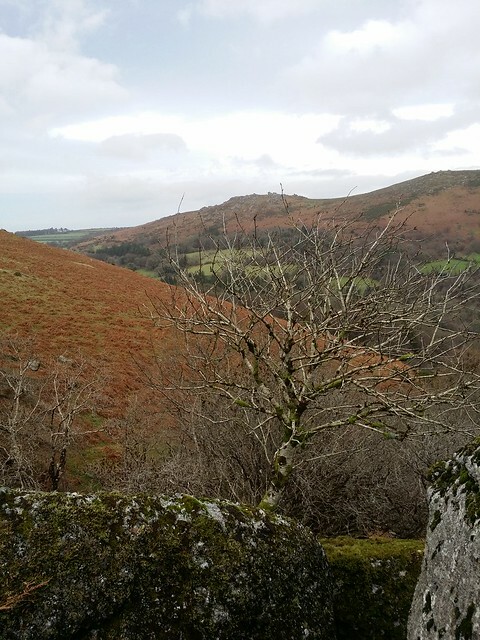 I recall fondly sitting atop the granite, with a hot flask of coffee, surveying Headland Warren Farm below and Challacombe Down across the valley. In the distance, you can see the dense Fernworthy Forest and the awesome North Moor. To the south, lay Grimspound, cradled between Hookney and Hamel Down. Once again, we were aided across the down with our backs to the elements. 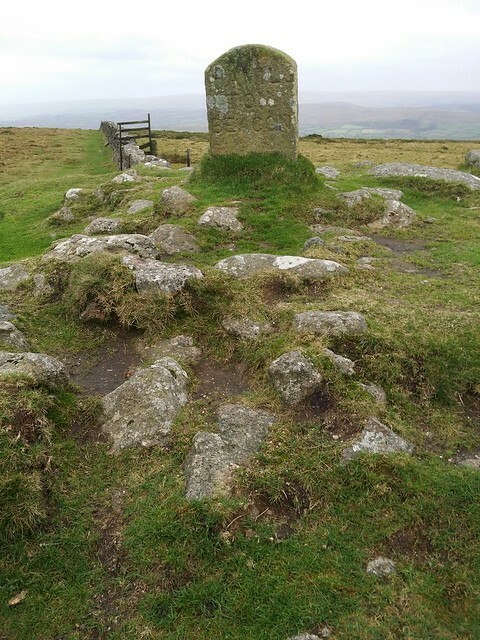 Before we reached King Tor, we took some time out from the weather in a large cairn known as King's Barrow. 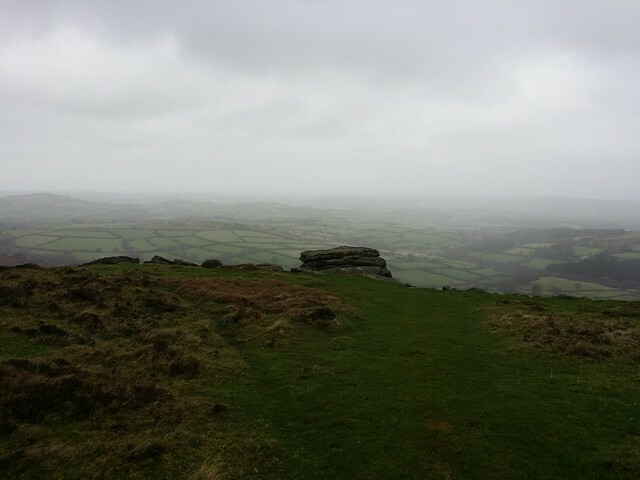 As we approached King Tor, to the north the weather looked miserable. I was grateful that the wind direction meant it was not heading our way, but I was also conscious of the fact that once we turned from the tor, we would be battling against the full force of it for much of the remainder of the day. 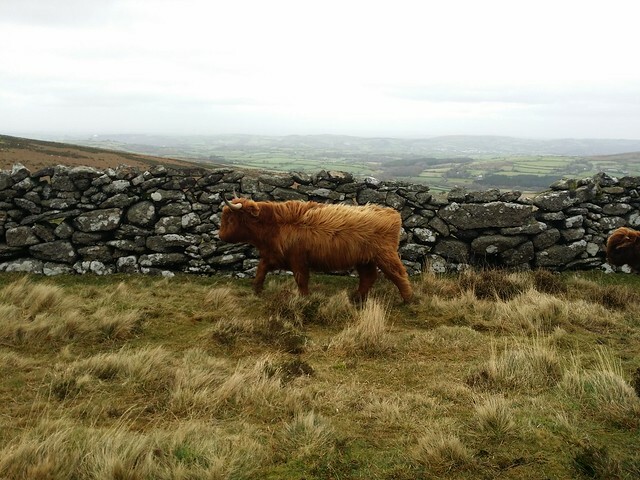 I am in no doubt that on a good day, King Tor will boast some of the finest views in the national park. To the east we could see our walk from last weekend, with Easdon Hill, Cripdon Down and Hayne Down. I could even make out the lump of Manaton Rocks. Bodies angled forward, we pushed on along a combination of animal tracks and marked paths down to the Bronze Age enclosure known as Grimspound. We sat within the ruins of one of the better preserved huts. We can only imagine how cosy it might have been back in 1300 BC, when it was first settled. On a day like today, likely, we might not have continued any further. Now what stood before us was our one real bit of proper ascent. 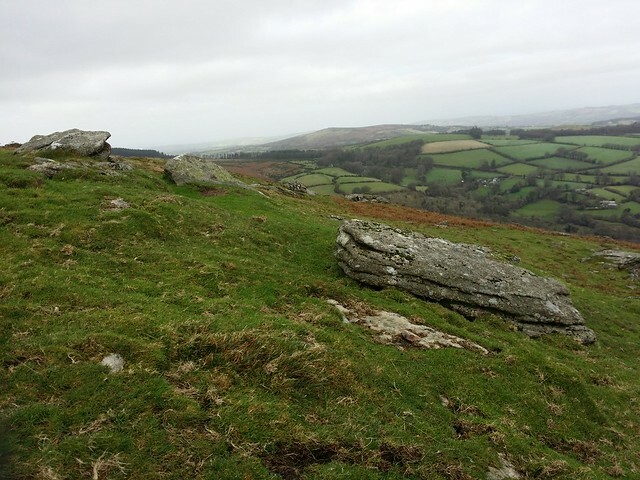 In my mind I figured that once done, we were in for a leisurely stroll to Widecombe, with only one diversion I knew could possibly scupper that idyll. I found climbing the hill, into the wind, to be tougher than normal. It was difficult to draw decent breath when the air is coming at you at up to fifty miles per hour! At times, I could feel my face being contorted by the force rushing towards me. 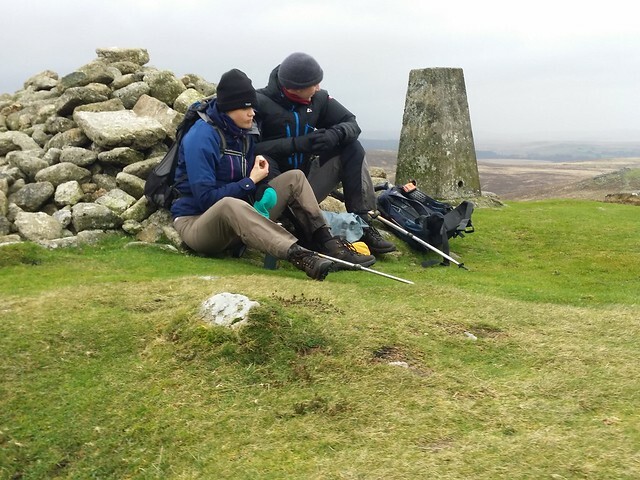 At Hameldown Tor, we hunkered down behind the cairn beside the trig point. I supped on some warm blackcurrant juice while Phil and Sarah had a bite to eat. Now a straight wide, path south lay before us, a section of the Two Moors Way. We now had a simple succession of bags over the next couple of kilometres. First up, the hill of Hamel Down, at Broad Burrow. 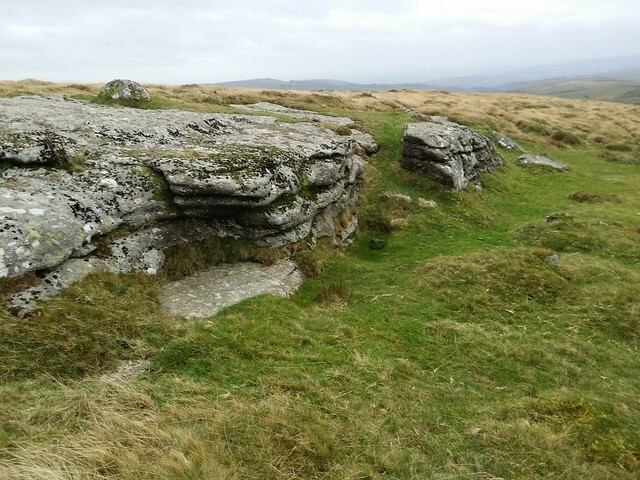 Next, it was past Two Burrows and along the relative shelter of a wall to Hameldown Beacon Rocks. Now it was time to go off road. We struck east, across uneven, low grass, following any semblance of a path. We tried not to descend too much. A patch of boggy green was obvious in the re entrant dropping to the right, so we contoured as best we could. We made it to a track, likely forged by a farmers quad bike. 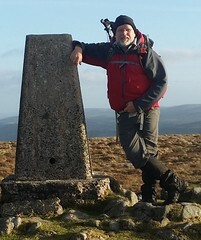 We kept on it to the lowest point, then turned right up towards the highest point of the hill, where a cairn awaited. Within the cairn, there was a marker stone with the inscription "Old House". I know nothing of the history behind this; was there a house nearby? If you know anything, please let me know. It wasn't far east, down the hill, to Old House Rocks. 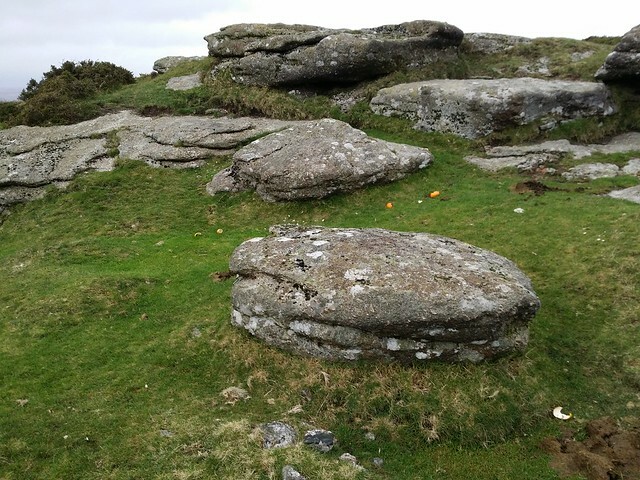 This collection of granite had a royal box seat across from Honeybag, Chinkwell, Sharp, Bell and Bonehill Rocks. We turned back, to rejoin the Hamel Down ridge path, tramping carefully down a hillside of heather into the re-entrant we had avoided before. 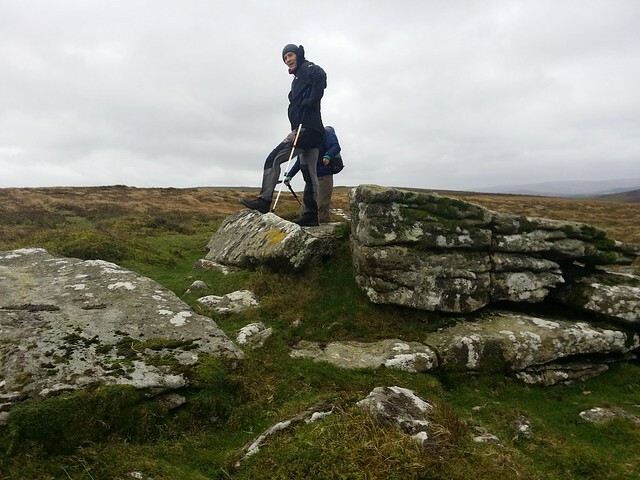 As expected, this was a soggy boggy section that had Sarah declaring it was now a proper Dartmoor walk! Climbing out, we spotted a visible deep scar, I assumed to be the remnants of mining, heading up the hill to the ridge, and with the lure of respite from the wind, we made for it. Whilst the wind abated amongst the walls of the ditch, it still had a number of feather beds that caught me by surprise. Before leaving the shelter, we stopped for food and drink where the draft was least. 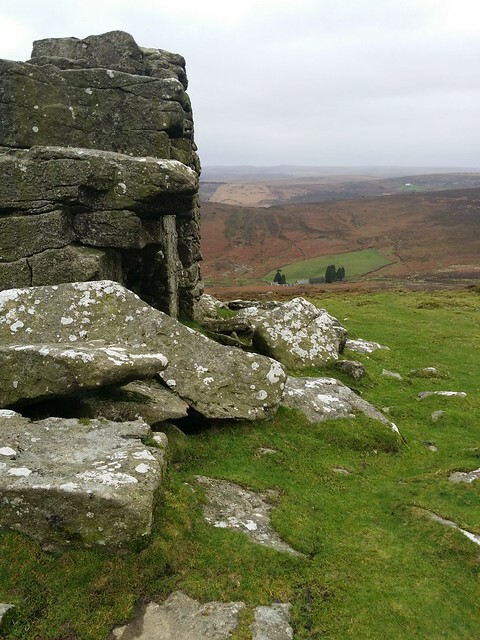 Returning to the Two Moors Way, we soon veered right in search of Kingshead Tor, or should that have been Stoneslade? There was some confusion with these next two tors. At the time of the walk, it was accepted, but it niggled, and when I got home I looked them up in Ken Ringwood's book, and alarm bells rang. The photograph's in Ken's book didn't appear to match with what was on the ground so I Googled both tors, looking for other images. 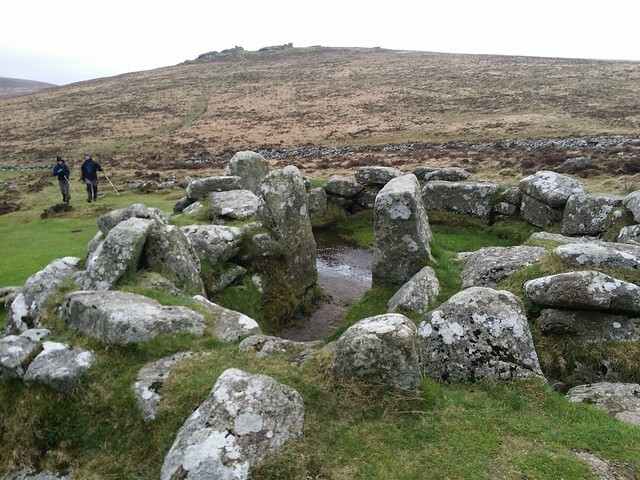 My suspicions were confirmed, thanks to Tim Jenkinson, with the photo linked here, which also provided some helpful information about the tor. The granite slab, on the western side of the hill, was apparently described, by Eric Hemery, as the largest rock on Hamel Down, and, while low, it certainly was substantial. 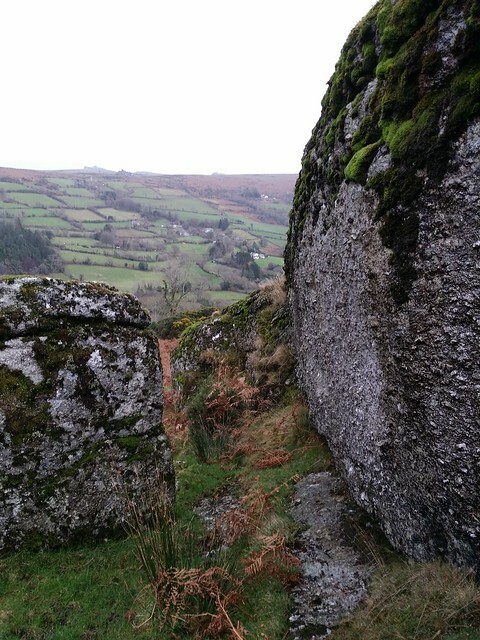 This was Stoneslade Tor. 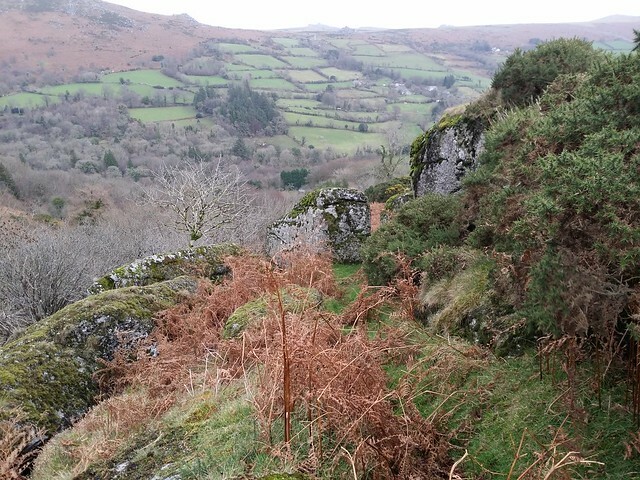 We wandered back to the path, continuing south in search of what should now be "Kingshead Tor". 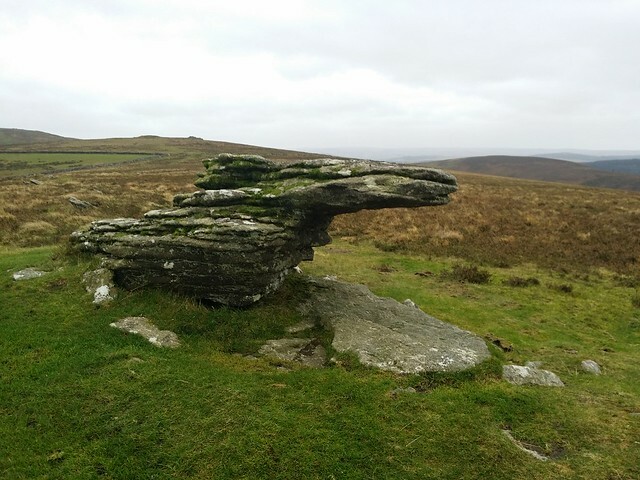 Once again, I bow to Tim Jenkinson and his knowledge of the area, and whilst I couldn't find a picture taken at the same angle, the picture linked here convinced me this was Kingshead Tor. With Kingshead in the bag, we had one more to visit. We struck east, again, down the hill, eventually picking up a path and steering right of a stream that dropped steeply to the East Webburn River. We found a marked path, and made for it, spotting lots of rocks on the hillside, surmising they might be Wooder Goyle Rocks. 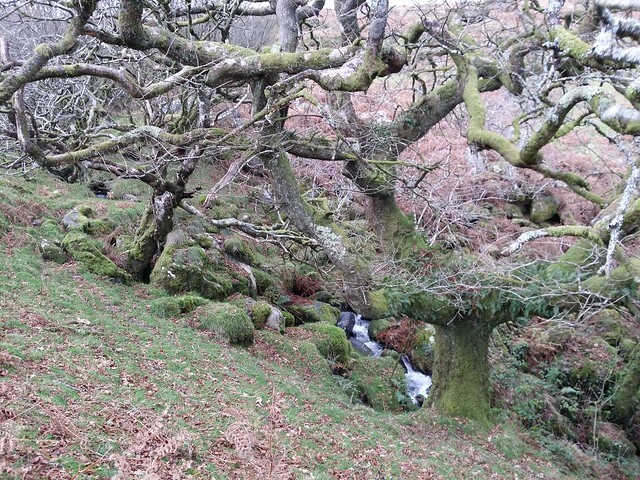 But at a ford to the stream, known as Crossing Place, I could see larger outcrops lower within the trees. Phil had spotted the higher outcrop and he and Sarah went straight to it, whereas my eyes fixed on a bit of adventure amongst the woodland. I ended up pigeon stepping a steep bank, eventually coming out below the outcrop they were stood. I really liked this find; with the cascading waters and the oak trees, it will be one to return to when the foliage has returned. 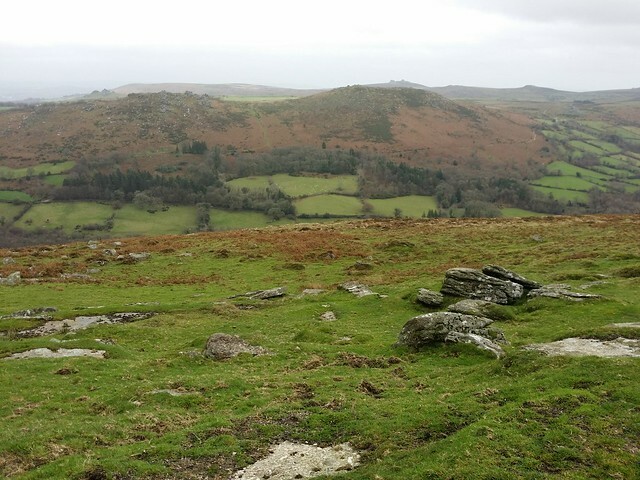 And being so close to Widecombe, it won't be too much of an arduous task to get to. All that remained was to pick up a footpath down through the fields of Kingshead Farm, and onto a steep concrete lane to the village. Down, out of the wind, it was something of a relief. We dropped our gear off at the car, then popped into the Old Inn for a swift half of ale. Conscious we couldn't relax just yet, Sarah drove us back to the Warren House Inn to pick up the car, and enjoy a well earned dinner by its roaring fire. A great end to a challenging day!